A quiz about the music we play in our restaurants. BeatQuiz is a new kind of music quiz. Generated in real time, it is based on the actual music your hear in our Swedish restaurants. Challenge yourself or your friends in a unique game while discovering the music we play. Pay attention to the music being played on the restaurant sound system. Launch the McDonald's app to get quiz questions pushed to your phone. Nail the questions to score points and climb the daily leaderboard. Visiting with friends? Challenge them in a best of 10 question match. Social for real. Only at McDonald’s. BeatQuiz is about engaging with the real world, music and friends at our restaurants and escaping our earbuds and social media bubbles. 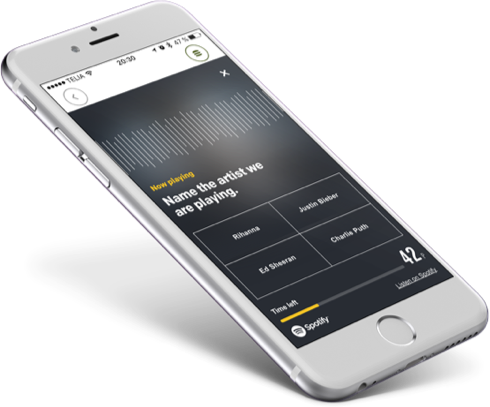 It can only be played at our restaurants, and is built right into McDonald’s Sweden’s smartphone app. For now, BeatQuiz is available only in Sweden. Love to discover new music? So do we. At McDonald’s Sweden, we put a lot of effort into providing a soundtrack way beyond an anonymous backdrop. Our music is selected by some of Sweden’s best music editors and DJ - fresh, new and always evolving. Copyright ©2010 - 2016 McDonald's All rights reserved.